I submitted Marlie's photo to the Cutest Baby Contest over at Baby Makin(g) Machine blog. So please vote for her (you don't have to register or have a blog account). The ballot is on the left side toward the bottom (you have to scroll a bit). Just select #8 (that's Marlie) and hit the VOTE button. Easy peasy! 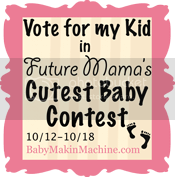 Voting ends at 11:59 pm on Sunday, October 18th, so get over to Baby Makin(g) Machine and vote for my baby! And while you are there buy some tickets for the raffle event. 100% of the proceeds are being donated to the March of Dimes. Every dollar counts toward saving babies! Going to vote for cutie Marlie right now! I voted for your lil' cutie! Off to vote for #8! BTW, I saw your comment on Speaking from the Crib's caption contest-hilarious! I think that it's such a fun idea that I've totally decided to bite Kelly's style. Please stop by and create a caption for a photo on my Blog. I'd love to see what you can come up. I will most definitely go vote for LMM! If you get a chance, will you please take a moment to drop by my blog and read my latest post about precious baby Wyatt? His parents really need our help. I would really appreciate it! No, YOU are amazing! Thank you SOOOOOO much!